Cut to mounting misery in the weeks leading up to the race – disrupted training due to weather and family circumstances as well as a weather forecast that showed the race day temperature creeping towards 30 degrees. When I flew out on Friday, it had settled on 28 with no cloud cover. Even though I was in decent shape from training, a personal best was out of the window – just getting around in one piece would be the main aim. On race day, the forecast proved depressingly accurate and I had built up a sweat just walking to the start. Once I got there the organisation was first class with a plentiful supply of loos (all with toilet roll) and an efficient bag drop giving me plenty of time to sit in the shade and ponder a race strategy. Whilst furiously applying extra sun block and trying to ration the water I had taken with me, I got talking to an Aussie chap who had lived in the city for five years and run the marathon a few times. Seeing the opportunity for some inside information, I asked for some course tips. His only advice: “Drink lots of water”. Great. Unusually, the race began at midday and eventually we were ushered out into the sun and towards the start line. It was here that I finally settled on a strategy – as one of life’s natural pessimists I knew that I would struggle in the heat but the question was how much? Going too quick would almost certainly lead to an early finish and an unhappy day out so I decided to try and start with a steady 8 minute mile pace and see how long I could maintain it. That worked out a fair bit down on my original race pace but would be easier to work out if I was on track at the 5k split points. Entering my starting pen, I saw the 3:30 pace runner so reasoned that if I stayed behind him it might see me about right. All the stops were pulled out for the start – a rendition of the Swedish national anthem, a fly past by the Swedish equivalent of the Red Arrows and a five-gun salute as we crossed the line and set off. The first two miles were slow thanks to a combination of narrow roads, weight of numbers and trepidation over the weather but eventually space started to appear – at least until the first water station. Due to the conditions, the organisers had increased the number of water stops placing them roughly every 2k, along with additional showers at most of them. With runners bunched up in the early stages it was difficult to notice them approaching, the only clue being when the mass of people in front suddenly dived to the left and stopped. Getting a drink was a bit of a challenge, dodging through a group of people to grab a cup before weaving back out again without being trampled by those behind. To be quite honest, it took me about until about half way round to get the hang of it. During the Expo the day before, we were all also offered a sponge to use during the race and with water troughs placed along the course to soak them in really made a difference and probably stopped me overheating during the race. The course itself had apparently been changed for this year’s event, but still took in the seven islands that make up Stockholm. Basically, three separate loops with only one small repeated part as you returned to the Olympic Stadium at the finish. Support throughout was fantastic, with the crowd enthusiastically cheering everyone – and some generous locals even running hosepipes out of their gardens to provide additional shower facilities to grateful participants! I don’t think there were any parts where support dropped, even at halfway when we ran through a large park. There, a lot of people had brought picnics and seemed determined to spend the afternoon in the sun clapping everyone through. As the race progressed, I felt happy with my pace and seemed to be managing the heat thanks to the frequent water stops. Slightly worryingly, despite being slightly behind the 3:30 pacer my watch seemed to be showing times a bit quicker than that. I just hoped that this wouldn’t cost me in the latter stages. This feeling only increased as we passed the 30k mark and the number of people walking began to increase. I also saw quite a lot of people who had dropped out, some looking in quite a bad way being helped into shaded areas to recover. Unfortunately for me this had the opposite effect and I did what I promised I wouldn’t do, gritted my teeth and pushed a bit towards the finish. Heading into the last 10k I felt in reasonable shape and was maintaining pace. We headed back towards the centre of town so the crowds swelled, which gave us all a much-needed boost. The last few refreshment stations were a blessing, even if they appeared to have been set up as a cruel joke to dispense increasingly random things (in order: salted gherkins, the world’s foulest tasting energy gel and warm vegetable stock – surprisingly tasty). Unsurprisingly, I started to feel a bit ropey at around 22 miles and the heat was starting to become an issue, the breathing becoming noticeably heavier and the legs definitely a bit stiffer. Luckily by this point I was onto the final part of the course which repeated some of the first five miles so I gave myself a bit of a talking to in order to keep going – last time past this building, final hill, three more turns etc. When we made the last turn and I could see the Olympic Stadium looming ahead I managed another push and passed the pace group (who I think had started to hold back having definitely gone a bit too quick). The finish was fantastic, we entered the Stadium and did a lap of the track. Supporters could sit in the stands so there was a lot of noise to push you along and a big screen to show your placing as you crossed the line. I was 892nd in 3:27:44 and was delighted to have conquered the course in those conditions. After being handed a medal, it was a short hobble next door to collect my belongings and avail myself of all manner of free food and drink. Although I was disappointed not to be able to make an attempt at a PB, I was pretty pleased with how things went on the day. My splits were consistent and I finished as strongly as I could, which was all I could hope for in the conditions. Speaking to fellow runners afterwards, most were of a similar mindset, disappointed with their time but happy with their finishing position which showed they had run a good tactical race. In the end you can’t plan for freak weather conditions and just have to make the best of it. I would definitely recommend the event, great support and impeccably organised (free travel on the Metro system for runners on race day meant one less thing to worry about). The course takes in lots of the city, which if nothing else is a very lovely part of the world. I wouldn’t say the course has PB potential as there are a few too many hills and one particularly unpleasant bridge at about 21 miles. You do get a fancy T-Shirt, chunky medal and all the post-race food you can get down which is a reasonable pay-off. I would certainly consider another Scandinavian trip if London inevitably knocks me back again next year – after all it must be third time lucky mustn’t it? The race overall was won by Kenya’s Kawi Kiptui in 2:13:30, with everyone’s favourite runner Yuki Kawauchi fourth in 2:22:57. The fastest woman was Mikaela Larsson in 2:40:28. 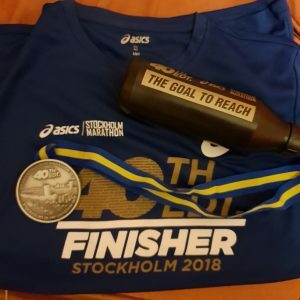 Enjoyed reading about the Stockholm Marathon. 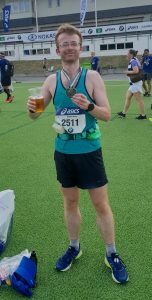 CONGRATULATIONS Andy, on completing the race in a very `respectable` time. Context (eg.weather on the day,course characteristics,numbers participating) is always a significant factor when assessing how well one has done. I think that you did really well,and did BvH proud.Hold your head up high!